Text Cannot be Normal Summoned/Set. 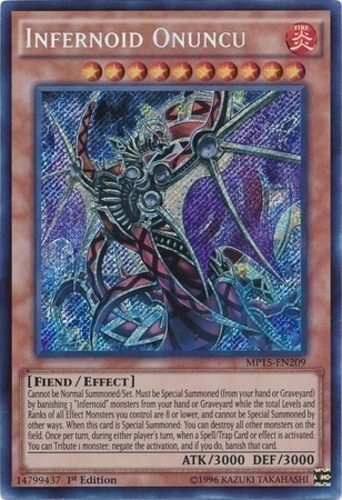 Must be Special Summoned (from your hand or Graveyard) by banishing 3 "Infernoid" monsters from your hand or Graveyard while the total Levels and Ranks of all Effect Monsters you control are 8 or lower, and cannot be Special Summoned by other ways. When this card is Special Summoned: You can destroy all other monsters on the field. Once per turn, during either player's turn, when a Spell/Trap Card or effect is activated: You can Tribute 1 monster; negate the activation, and if you do, banish that card.